Does anybody really know what time it is? Does anybody really care? OK, let’s fast forward past the daylight-darkness, sundial, wind-up and quartz watch timing eras … nowadays, transportation, communication, financial transactions, manufacturing, electric power and many other technologies have become dependent on accurate clocks; folks need to be more accurate than being “about” a certain time. The National Institute of Standards and Technology (NIST – an agency of the US Department of Commerce) laboratories in Boulder, Colorado does the computing for us and even broadcasts the UTC(NIST) via various means. (UTC(NIST) is the US national standard for measurements of time-of-day, time interval and frequency. Whoa, that’s waaay more information than I needed; … and, I think you are confusing me with someone who cares. (Short answer, those guys “keep” the time.) OK, let’s move on. If you really want to know what Time it is, go to http://nist.time.gov , select your desired time zone in the US and the time will be displayed for you. Or, call to hear the “Time” broadcasts by dialing (303) 499-7111 for WWV (Colorado) and (808) 335-4363 for WWVH (Hawaiʻi). These are not toll-free numbers; callers outside the local calling area are charged for the call at regular long-distance rates. The telephone time-of-day service is used to synchronize clocks and watches and for the calibration of stopwatches and timers. It receives about 2,000 calls per day. The information broadcast by WWVH includes time announcements, standard time intervals, standard frequencies, UT1 time corrections (time derived by astronomers who monitor the speed of the Earth’s rotation,) a BCD time code (time data is coded binary coded decimal (BCD) digits in the form HH:MM:SS:FF,) geophysical alerts, marine storm warnings and Global Positioning System (GPS) status reports. Voice announcements are made from WWVH once every minute. The announced time is “Coordinated Universal Time” (UTC). Coordination with the international UTC time scale keeps NIST time signals in close agreement with signals from other time and frequency stations throughout the world. UTC is a 24-hour clock system. When local time changes from Daylight Saving to Standard Time, or vice versa, UTC does not change. However, the difference between UTC and local time may change by 1-hour. UTC runs at an almost perfectly constant rate, since its rate is based on cesium atomic frequency standards. WWVH began operation on November 22, 1948 at Kihei on the island of Maui (the site now houses the Hawaiian Islands Humpback Whale National Marine Sanctuary offices.) In July 1971, the station moved to its current location, near Kekaha, Kauaʻi. For those wondering why these two facilities, that are west of the Mississippi River, have call signs that start with “W” (typically, station call signs west of the Mississippi start with “K” and those east start with “W,”) the time station’s early location was in Washington, DC (May 1920) – when it moved to Fort Collins (1966,) it kept the call sign. For consistency, Kauaʻi followed the call sign pattern. 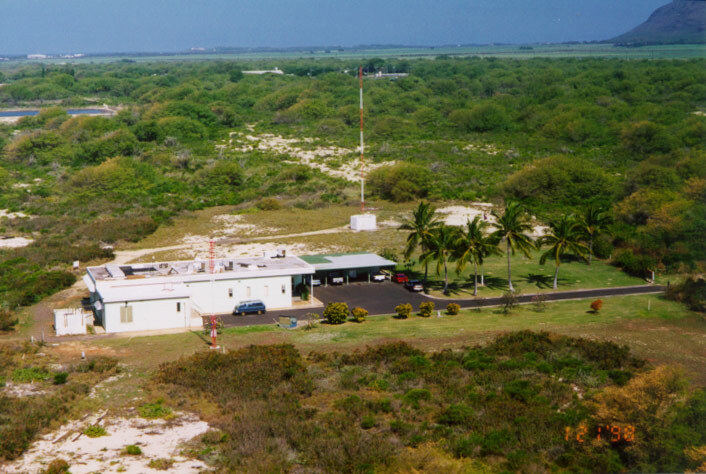 The image shows the WWVH facility on Kauaʻi; in addition, I have added other related images in a folder of like name in the Photos section on my Facebook and Google+ pages.